An award-winning constitutional law scholar at the University of Chicago (who clerked for Judge Merrick B. Garland, Justice Stephen Breyer, and Justice Sandra Day O’Connor) gives us an engaging and alarming book that aims to vindicate the rights of public school stu-dents, which have so often been undermined by the Supreme Court in recent decades. Judicial decisions assessing the constitutional rights of students in the nation’s public schools have consistently generated bitter controversy. From racial segregation to un-authorized immigration, from antiwar protests to compul-sory flag salutes, from economic inequality to teacher-led prayer-these are but a few of the cultural anxieties dividing American society that the Supreme Court has addressed in elementary and secondary schools. 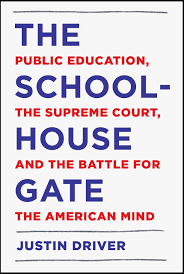 The Schoolhouse Gate gives a fresh, lucid, and provocative account of the historic legal battles waged over education and illuminates contemporary disputes that continue to fracture the nation. Justin Driver maintains that since the 1970s the Supreme Court has regularly abdicated its responsibility for protecting students’ constitutional rights and risked trans-forming public schools into Constitution-free zones. Students deriving lessons about citizenship from the Court’s decisions in recent decades would conclude that the following actions taken by educators pass constitutional muster: inflicting severe corporal punishment on students without any proce-dural protections, searching students and their possessions without probable cause in bids to uncover violations of school rules, random drug testing of students who are not suspected of wrongdoing, and suppressing student speech for the view-point it espouses. Taking their cue from such decisions, lower courts have upheld a wide array of dubious school actions, including degrading strip searches, repressive dress codes, draconian “zero tolerance” disciplinary policies, and severe restrictions on off-campus speech. Driver surveys this legal landscape with eloquence, highlights the gripping personal narratives behind landmark clashes, and warns that the repeated failure to honor students’ rights threatens our basic constitutional order. This magiste-rial book will make it impossible to view American schools-or America itself-in the same way again.